The RADAR key Company have manufactured the vast majority of keys many know as RADAR keys over the past 25 years. They are needed to open a large number (10,000 plus) of accessible toilets in the UK which are part of the National Key Scheme (NKS). RADAR is an organisation that no longer exists – it became part of a new company Disability Rights UK (DRUK). They started the National Key Scheme in the UK. The RADAR Key Company no longer supply keys to DRUK but continue to make the keys for the National Key Scheme and improve on them. What toilets do they open? The keys open toilets fitted with the RADAR National Key Scheme (NKS) locks. 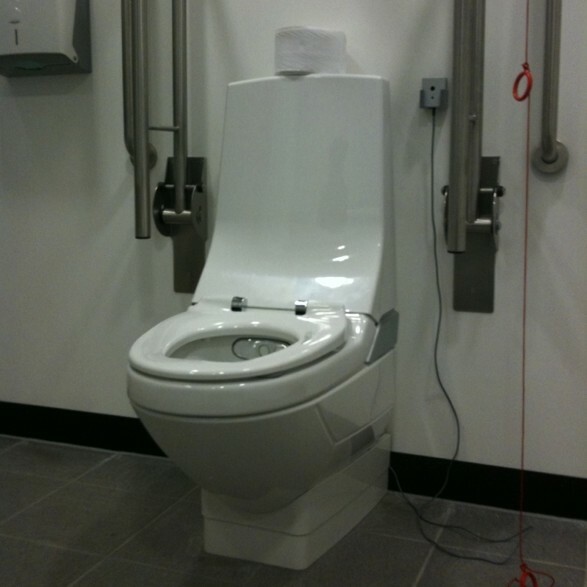 Toilets fitted with these are for the use of disabled people and are found all over the country (e.g. pubs, restaurants, leisure venues, tourist places, shopping centres, stations, airports etc). A new solid brass key. They are long handled to bypass vandal protection blocks built into doors. Any individual with an impairment / medical condition who needs access to these larger toilets or hygiene facilities or needs facilities to assist mobility or navigation (such as hand rails, lower basin, contrasting colours, different toilet height or seat arrangement, changing table, hoist for example). One downside is that you do not need proof of need to purchase one so parents and non disabled people can abuse the scheme. Where do I buy a genuine key from? Other sellers of ‘genuine’ keys include this one from Disability Rights UK (4.50). [personally I prefer the improved brass one as opposed to a love heart blue key that is rather stigmatising. Some may prefer it if they want it to stand out and know they have it in their bag]. I have seen them for sale elsewhere – do they work? There are hundreds of places claiming to sell ‘genuine’ keys including many prominent charities and mobility shops. Most have a red handle and are mass produced in China. I strongly advise against these keys. One of the reasons for making a new brass key is to avoid people being ripped of by fakes that may be so rough cut and out of shape that they don’t easily open toilets, if at all. Keys may not be tested by a master locksmith or damage locks. “Disabled people need genuine Radar keys because they are dependent on them to open what is often the sole toilet which they can use. Genuine keys genuinely work all the locks because they have extra machining processes and are more reliably cut and also more accurately cut. Each one is tested on a radar toilet lock (not the padlocks which are a more basic mechanism) by a master locksmith to guarantee that a disabled person does not suffer. Identification of genuine keys is easy – if it says “radar” and ‘NKS’ on it, it is a genuine radar key. If it doesn’t then it is an inferior copy. How do I find a toilet? A free App is available for Changing Places toilets and coming soon will be one for other accessible toilets. This is available for Android and Apple phones and on the web. A booklet for regional locations is available on the DRUK website costing £3.50. However, it will cost you £70 to purchase all regions!! I’d download a free App to find their locations made by the RADAR Key Company! The majority of toilets use the scheme so it’s probably best to just follow signs to toilets/accessible toilets as anyone would do. Why are accessible toilets often locked with these in the UK? Many places choose to install NKS locks on their toilets to keep them clean and reduce the chance of them being abused by people who don’t need to use them, vandalised or used for drugs, sexual activity or a wide range of other things!